In the late 1980's a movie came out in theaters called "Stand By Me." It was a coming of age movie involving four teenage boys who take a journey across their rural county to look for a dead boy who was missing that had been hit by a train. It was set in the 1950's when times were still simple and listening to the radio was a genuine treat with mailbox baseball being the recreation of choice for any misguided teen with a driver's license. Money was scarce and having little the four boys pooled all of their change together while in route to Ray Brower's dead body to purchase some snacks at a five and dime. To reach the store however you had to trespass through an old junk yard which was guarded by an infamously fierce dog named Chopper. No one wanted to have to hear the dreaded phrase, "CHOPPER, SICK BALLS!" So to decide who had to get the food they chose to flip coins and whoever was the odd man out would have to try and avoid the vicious canine. After flipping the coins all four pieces of currency landed tails up meaning that it was a GOOCHER! To Vern, the husky one that could only mean one thing, impending doom. Sure it was a silly superstition, but most baseball players have them. Whether it is something as minute as not stepping on the foul line while heading back to the dugout or as extreme as sacrificing a live chicken to regain one's hitting stroke, like in the movie "Bull Durham," most baseball players exercise some form of superstition. Apparently the Cardinals have had a few Goocher's this season. What else can explain their bouts of offensive anemia. Just after the All Star game, 98 games into the 2010 campaign the Cardinals have been shut out 9 times already. With 64 games remaining they are on pace to lay 16 gooseggs. Compare that with last years Central Division Champions who were the victim's of only 10 shut outs all season long. Referencing this statistic from a historical perspective does not bode well for this team's aspirations of reaching their 18th World Series appearance. Going back to the Redbirds championship team of 1982, no Cardinal fall classic participant had been shut out more than 8 times in an entire season. The '82 team was blanked 6 times, the exciting track team of '85, 7 and the 1987 club was skunked on just 4 occasions. During this decade the 2004 National League Champs put up just 4 zeroes in 162 contests, the 105 win underachieving club of '05 had 6 and the overachieving 2006 World Series winners had only been shut out 8 times during their unlikely run in to October. So how can a team with Albert Pujols, Matt Holliday, Ryan Ludwick and Colby Rasmus put up this many ovals? And why is it our first priority before the much anticipated trade deadline to acquire an arm before another productive bat? If our potentially potent offense could contribute as well as our sharp pitching has thus far this team would be many games up instead of running neck and neck with the scrappy Cincinnati Reds for the Division lead. The power laden line up of St. Louis has scored 2 runs or fewer in 31 games. They have tallied 1 run in 12 different games, 2 runs in ten and like I mentioned before, they have been goosegged 9 times. During the 31 games in which the Birds have crossed the plate 2 or fewer times our pitchers have given the offense plenty to work with allowing 3 or fewer runs in 15 of those contests. Our overall record is 3-28 when we score 2 runs or less. Which would be acceptable if our pitching was as porous as the Cardinals lack of timely hitting. The Cards pitching has kept us afloat this season. 22 times this year has our muscle bound offense scored one run or less and yet our moundsman have kept up their end of the bargain by allowing only two or fewer runs to score in 11 of those games, yet they have only one win and 21 defeats to show for it. That is too many high quality starts gone wasted. Imagine if this team could have capitalized on just over 50% of those 15 pitching gems and won 8 of those very winnable games. We would be 26 games over .500, 7 1/2 games out in front of the Reds and be tied for the best winning percentage in baseball with the New York Yankees.That is why we need more offense before mortgaging our future away on a soon to be 33 year old pitcher in Roy Oswalt. A win now attitude is great, but if it means giving up too much for the future of this franchise is it worth it? Not in my humble opinion. The obvious concern to me is by taking on Oswalt's contract it might paint the Cardinals into a financial corner. Not allowing management the full monetary freedom they deserve when addressing Albert's future. Sometimes no move is the best move while exercing patience for the marathon that is a baseball season. I truly believe that this Cardinal team has had some bad breaks and the offense will become more consistent and productive as the dog days of August approach. Sure it sounds like an unstoppable rotation throwing Cris Carpenter, Adam Wainwright and Roy Oswalt at the competition the rest of the way as strong arms win championships, but no amount of pitching will help us out of a short post season series against equally high quality starting pitching if our offensive struggles continue. Plus Rookie of the Year candidate Jaime Garcia's 9-4 record with a 2.21 E.R.A. is nothing to sneeze at. He is the only R.O.Y. we need. So before this organization rushes to judgement and jeopardises the franchise's future by acquiring an over the hill Oswalt whose best years are behind him. Just remember those Whitey Herzog teams of the 8o's and even our recent championship squad of '06 when we overachieved and did more with less.This team is stacked with talent. So let them play. I read recently in the St. Louis Post-Dispatch where Whitey was quoted as saying he would let his players play for 6 innings and if they were behind after that the game was his to win or lose. Well I believe Mr. LaRussa should do just that and take a page from recently inducted Hall of Famer. Stick with a certain line up and just let' em play! No more sitting Colby Rasmus for Randy Winn, benching Ryan Ludwick for no reason, and flipping middle infielders like they were those coins in that classic movie. Maybe Tony has flipped his line up around one too many times and those Goocher's are finally catching up with him! Now Cardinals, HIT BALLS! Congratulations Mr. Herzog, on your induction into the hallowed Hall of Fame. You deserved this honor long ago, but better late than never. Thank you so very much for all of the memories and being a true class act. 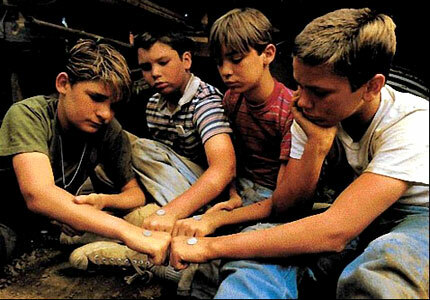 Loved that movie Stand by Me! I couldn't agree with you more--Larussa needs to quit toying with the lineup and just let those pro-athletes do their job. I feel that a lot of the team not "gelling" has to do with many of the younger players feel like they are fighting for a position instead of being set in a lineup. There are times for pinch hitting but I've never seen a manager so wrecklessly change a lineup so often. I know Larussa's a numbers (stats) guy but he's beyond ridiculous with his micro-managing attitude. Let the players play!